Individual sessions are fifty minutes in length and take place in my art studio in my home. Sessions may be covered by your private insurance provider. Art therapy groups for four or more people are created and designed for the specific group served. Group work is a great way to foster community and build on each other’s strengths. All my workshops are aimed to engage, inspire, and motivate participants. Follow me on social media to learn more about upcoming workshops! Certified in The Foundations of Happiness in the Workplace, from UC, Berkeley, I can help your team by offering stress reduction tools and team building activities. No skills required. 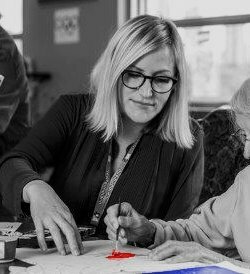 Art therapy is about connecting with the art materials and becoming fully engaged in the art-making experience. Through art, we can safely explore areas of our lives that may be difficult to confront. Art therapy is a form of psychotherapy that encourages self-expression and exploration through the arts. It can be used as a healing tool, a method of self-discovery, or as a form of self-care.